Next up will be the TPS sensors/transmitters in the wheels (one has a failed battery, so the other can't be far off too) but this will have to wait until the Pirellis are toast. I also need to do a bit more investigation on the Concours website as Kawasaki say the sensors have to be replaced ($$) whereas I believe some owners have experimented with dissecting them and replacing the $5 battery. Dropped the VTR into the bike shop this morning for a new front tyre, a warrant and now some unexpected suspension work (more on this when I know more) and the guys there gave me a nice little 600 Hornet for the day. When I first got on it, it was happily buzzing away as it warmed up for my short ride to work. Climbing aboard, the ergonomics felt pretty good - a low seat height (both feet flat on the ground), nice wide bars with all the controls where they should be - it all felt pretty natural. The clutch was very light and as I idled out of the car park everything was feeling pretty good. I guess this is the smallest capacity bike I've riding in a while and naturally I noticed the lack of torque after climbing off the VTR - it is a 600/4 not a 1000cc twin. Riding in early morning rush hour traffic I found that shifting cogs at around the 4-5,000rpm mark was ideal and easily kept me away from the cars. Not too bad at all. With nice wide bars (wider than any other part of the bike by a long way) the handling around town was fine and it was a piece of cake lane-splitting up the side of a line of stopped traffic. Once again, it's smaller physical size and light weight made the handling feel "lighter" and it was a piece of cake to tip it into corners. Braking was absolutely fine with nice feel at the levers. Unfortunately, my commute does not include any open road riding (or any delicious winding roads) but on a few occasions I was able to give her a little handful and the motor gives a nice little growl as the engine revs past the 5,000 mark. Revving higher than this results in reasonably rapid progress being made without any risk of whiplash - power delivery is nice and smooth and probably ideal for a learner coming off a 250 or someone wanting a very nice little commuter. Overall I enjoyed my brief time on the Hornet and have to say that it is a very sweet looking bike and one that fits the the two roles mentioned above. I'm sure that it also would acquit itself reasonably well on a squirt through some nice twisties - particularly if the rider grabbed it by the scruff of the neck and gave it the berries. Another nice day in the Manawatu and a little chore to do - I'd bought some Osram +90 bulbs for my old man (from Powerbulbs UK) and had to get them to him somehow. So out came the little red Honda and off I went. Before leaving I had heard that it might be a bit foggy over Woodville/Danniverke way but as I didn't get on the road until just before 11 I thought that I'd be ok. Wrong! Deciding to make a ride of it by trying to avoid the main roads, I first took the Saddle and hit the fog right by the entrance to the Windmill lookout. It wasn't too bad but as I descended down towards Woodville it started getting a bit thicker. I nearly decided to pop back out onto the main road in the hope of less fog but in the end stuck to my plan and took in Topgrass road to Danniverke. It was a bit of a mission at times as the fog was reasonably thick in places and I still had to avoid cow muck, mud from tractor tyres and even a large hare. Turning back onto SH2 just South of Danniverke the fog vanished and I was riding in sunshine again. A quick top off in Danniverke and I was on the road again. Just a quiet pootle up SH2 and then a turn-off onto SH50 to take me on to Napier. The little slippery patch I discovered on the last trip over SH50 was still there but I managed to avoid it this time. I did however have to give a one-fingered wave to a car overtaking in a stupid place and coming straight at me - moron! In Napier I stopped off at the olds to drop off the bulbs only to discover they were not at home so I popped down into town to grab some lunch and catch up with a mate for a bit before the ride home. Leaving Napier I flagged a fuel stop in Hastings and decided to see if I could make Danniverke with what I had. Unfortunately I was on a VTR and by the time I went through Tiko I was on the last bar of my fuel gauge with about 50-60km to go. I probably would have made it but chickened out (didn't feel like pushing the bike too far) and stopped in Onga. With a full tank again there were no more fuel worries so I set off in a different direction towards Waipuk just to add a bit more interest to the ride. I ended up on a road I hadn't been on but soon popped out on SH2 again and turned towards home again. Determined to stay off the main road I took the back roads through Takapau, Ormonville and Makotuku and then back onto SH2 for the rest of the trip home. Another nice but chilly ride - where to next weekend? I've been through a lot of gloves over the years and my general preference is to wear thin gloves all year around and just tough it out (previous bike with no hot grips) or turn up the grips when the weather goes to custard. The main reason for this is the bulky and clumsy feel that winter weight gloves give. My current pair of Alpinstars are pretty comfortable and survived my little woopsie on the VTR pretty well. They pretty much get used in all weathers...until now. While down South for the TT2000, Brian and I were checking out the glove selection at Hampton Honda as Brian's gloves had let him down in the wet on the way down the coast. The sales guy showed us a set of Strada gloves and at $100 each we both ended up grabbing a pair. Later on in the trip we had to put up with some real West Coast rain when we rode to Milford Sound and back. The gloves really impressed us on this trip as they did keep us warm and dry in really wet conditions. At the end of the day I was just starting to feel a slight dampness - I think that the rain was just starting to penetrate the finger tips but that most of the moisture came from taking the gloves off and putting them back on with wet hands after photo stops etc. Since we've been back I haven't worn them much but I did use them again on Sunday when we riding in very frosty conditions. Initially I also used my hot grips on about 50% but as it got a little warmer (it never would have got over 10 degrees) the grips were switched off and my hands actually got a bit sweaty. 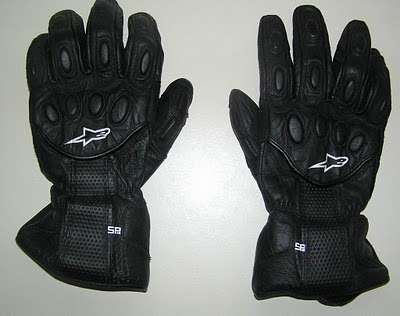 A short stint in my thinner gloves (without hot grips) and I was changing back to the Stradas for the trip home. Overall though, I'm really pleased with the gloves - they were a third of the price of the Goretex Alpinestars I was offered when I bought my jacket and pants and they perform very well in crappy weather. I also have got used to the bulk of them and at this time of the year I'll either be wearing them of they'll be coming along for the ride - just in case. Seeing more and more articles on electric bikes these days. I still reckon I'd miss an infernal [sic] combustion engine and they still don't have nearly the range I'd need but I think that they'll slowly start to make inroads into the commuter market. The MotoCzysz effort at the Isle of Man was certainly impressive and the below effort (the Brammo Empulse) is starting to get closer to what motorcyclists are looking for. I'm in: Group 5, 3:12pm! Bring it on! Yesterday the weather changed for the better - the rain and wind vanished and the sun came out. Unfortunately I didn't get out on the bike but I managed to well and truly make up for it today. We met up at the gas station at just ofter 9 and I then tucked in behind to follow him over to Fielding and then through to Halcombe. Very frosty through to Halcombe (not unusual) but the day was looking like it was going to truly be fantastic. It was obviously pretty chilly and I was happy to sit behind my big screen with the heated grips keeping my mits warm and toasty. caution especially through the shady bits. I stopped just after one frosty corner (see piccy) in the hope of catching Brian coming around the corner but I was a bit slow grabbing the camera. ten Highway but we ended up deciding on heading to Ohakune for lunch and the home given the chilly conditions. 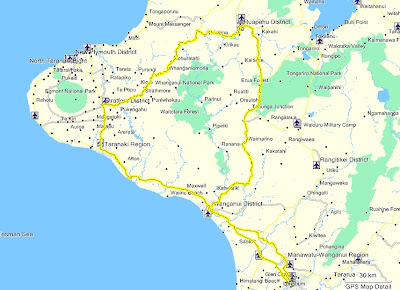 However, I must have planted a seed in Brian's mind as he pulled up in Ratahi and suggested lunch in Taumarunui and then home via the Forgotten Highway and the 'naki. I, of course took a lot of persuading but was eventually swayed and off we went again. A nice cooked brekkie (at 12ish), a quick top off of the bikes and we were soon turning onto the great highway 43 and motoring towards the Republic of Whangamomona. The riding was superb and although there was still some frosty bits the road was in good condition with very little traffic. The 16km of gravel was in good nick too although a couple of wet pieces did a great job of getting mud over the bikes. bikes before tackling the last stretch to Stratford. From Stratford it was just a quiet cruise home trying not to get too frustrated with the slow car drivers (who refused to pull over for anyone else) and avoiding any run-ins with the fuzz. Somewhere south of Stratford one of my headlight bulbs blew but we ended up getting home just after five - well before it got too dark. Another fantastic ride on a perfect winter's day! Yesterday, Supersonic posted up that the Nationwide Tag was in our area (he had scored it and placed in Danniverke) and as I was heading up to the Bay for the day I decided to go for it. I left Palmy in nice sunny weather but on wet roads so it was just a gentle cruise up SH2 to Danniverke. I stopped just outside of the town to get the tag and then again for a quick top up of the tank before continuing Northwards. 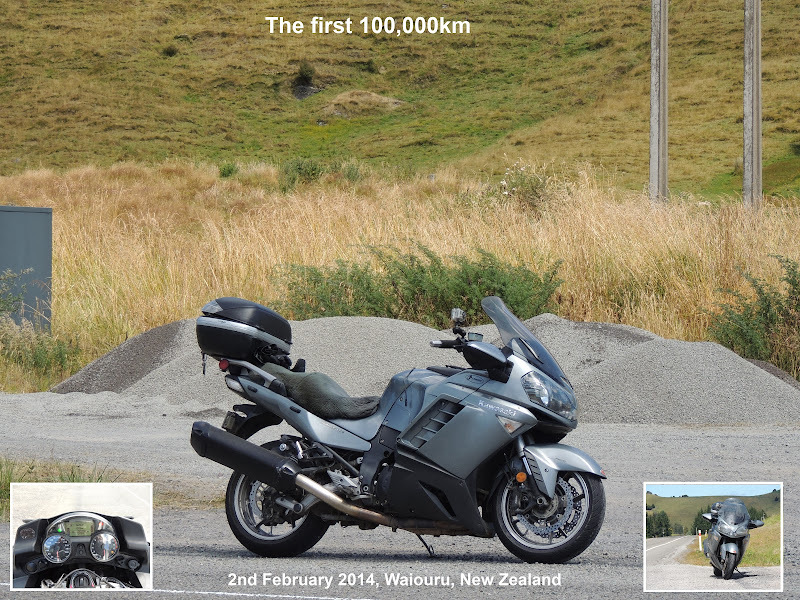 At Takapau I turned off to take SH50 and continued on in pootle mode as I took in the scenery and enjoying the ride. Heading over the hill I had one little moment on some slippery stuff (wet greasy tar) but otherwise got through my favourite bit of the road with no issues. At Maraekakaho I stopped to a piccy of what was going to be my tag before carrying on to my folks place in Napier. Bike parked, I raced up into the house and fired up their dial-up (shudder) internet to post the tag. Dang, once the page finally loaded I found out that I'd missed the tag and that it was now in Hastings! However there was some consolation in that my sister and her girls were visiting the olds so I got to spend the afternoon with them before gearing up for the ride home. The ride home was pretty uneventful except for coming across some boy racers on SH50 doing burnouts in the middle of the road. Talk about smoke! I actually buttoned off concerned that some idiot was going to come out of going sideways and take me and my little red bike out! Twats! I eventually got home just after 6 after a nice ride back in the dark. Heated grips rock!